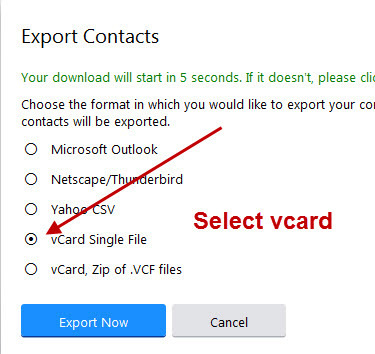 You can export your contacts from Yahoo to an external csv file, as a backup, or in preparation for transferring them into another email service/client or into an excel spreadsheet. Note: Exporting contacts/addresses has no effect on the original contact list. 1.Sign in and go to Yahoo mail. 2 Go to the Yahoo! Contacts. choose will depend on what you will be doing with the contacts. 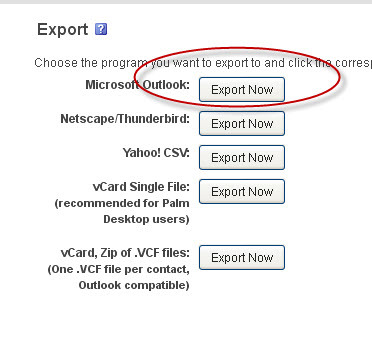 If you will be importing them into outlook or outlook express choose Microsoft outlook, and click the “Export Now” button. 5. When prompted enter the captcha code and then save the file. The exported .csv file can be use as an import file in Outlook Express, Gmail etc. contacts between Yahoo! Address Book and other clients. Most email programs support the .csv format so the file may be usable with other email programs not listed on the Yahoo export/import page. Vcards (virtual business cards) are a standard way of sharing contact information. They are generally used for sharing individual contact information rather than an entire address book. 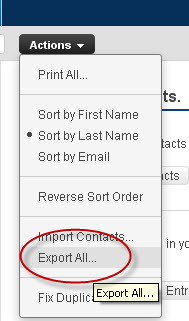 Yahoo doesn’t let you select individual contacts for export and will export all contacts. Unfortunately not all email providers or clients e.g. Outlook can use this file. Therefore the second option is probably safer as it exports the contacts into a ZIP file with one card (.vcf file) per contact. You can extract the contacts from the ZIP file and import them into your other provider/client. Lists aren’t exported with the contacts, as far as I can see, but some formats will show list membership so you can work back from there. Yahoo Mail was designed to be used by a web based client and emails and contacts are normally stored on the Yahoo Mail server. If you are using Yahoo with Windows Live Mail your Windows address book will be stored on your computer. Windows Live Mail doesn’t have access to the Yahoo online address book/Contacts list and there is also no way of synchronising contacts between the two systems. However you can export Yahoo contacts to a .csv file and then use the import tool included with WLM to import the contacts into WLM. I get errors when importing a contact list that I exported from Yahoo. – You may need to edit the csv file to match what your new email provider. This Article on how to create a csv file may help. Why does Yahoo provide different output formats for different clients e.g. Thunderbird, Outlook etc ? – This is because the import function provided by these clients expects the csv file to be formatted in a certain order. My Client is not mentioned can I still export the contact List? -Yes use the Microsoft option and edit the csv file to match your Client. How can I find out what header fields my client uses? Do an export from your client and look at the csv file. Use this header for the import header. Can I import the file into an excel spreadsheet? -Yes excel is commonly used to edit the file and remove unwanted email addresses etc.